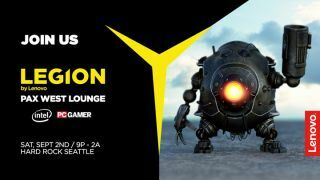 In partnership with Lenovo Legion, Intel and PC Gamer, the Lenovo Legion Lounge is one of the most anticipated PAX West events this year. Join Lenovo Legion at the Hard Rock Cafe on Saturday, September 2nd from 9 PM to 2 AM and party like a true gamer. Register for the event here for a chance to party hard and win big. More details to follow. Enter a special PAX West social giveaway sponsored by Legion by Lenovo for a chance to win a new notebook, tower or monitor. Enter by posting to #LenovoLegionLounge on your preferred social media channel (Instagram, Facebook and Twitter accepted). Giveaway is for US residents only. Winner does not have to be present at the event to be selected as a winner. Full rules are listed here. Please note that registration is required to enter the party; however entrance is first come, first served, so registration does not guarantee access. Please bring printed or digital ticket to event for entry.